According to the North Rhine Westphalian State archives in Münster the handing down of the Thonemann name started off in the monastic settlement of Scherfede in 1568 at the latest. At that time Joist I, brother of Abbot Martin in Hardehausen, was active as councillor and chamberlain in Warburg between 1542 and 1572, as many papers and council protocols show. Anyway during the lifetime of Abbot Martin Thonemann pressure was exerted for the final settlement of the high debt which their mother Metta after the premature death of her husband Johann V Heinrich Thone/Thonemann in 1536 had lent from the monastery bit by bit in the time after. 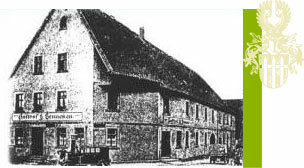 In other papers there is a remark under Joist Thöne/Thonemann "received monastery goods in Scherfede from Brother Martin". A Johann Thone/Thonemann (probably Martin‘s other brother, who was likewise entitled: Johann VI Thöne) was mentioned in another letter according to the remarks of the State archives in Münster in 1568. However it was recorded in the Hardehausen Monastery papers in connection with the Thonemann settlement: "the goods (plural!) in Scherfede are a matter of controversy with Tile Roling". Possibly the real estate belonging to the monastery was still in the use of Tile Roling through long-term leases. This also explains why Joist I of Warburg did not complete the move to Scherfede to cultivate the land himself. Anyway Abbot Martin Thonemann had gradually made monastery lands in Scherfede amounting to 60 "Malter" grain over to his mother Metta and confirmed this property later in a "Leibgedinge-Vertrag" (including regular payment in kind to the monastery) for the mother Metta and her three children (siblings of Abbot Martin: Joist, Johann and Else) in 1568 which was not however recognised by Hardehausen Monastery. A final arrangement concerning the settlement of the loan followed five years after the death of Abbot Martin Thonemann "two days after the feast of St. Jacob in 1572" in a settlement between Hardehausen Monastery and the siblings Joist, Johann and Else Thonemann. Mayor Johann Nabercord, Ulrich and Dietrich‘s brother was present as arbitrator for this settlement. A "Bemeierungsurkunde" (certifying that the holder is a free farmer) concerning the "big farm in Scherfede" is not available (any more). Abbot Martin was very fond of his brother Joist and declared him among others a free farmer on Sunday Laetare (third Sunday before Easter) with land in the Asseler Masche, half of which Jost von Eddessen from Warburg built on. 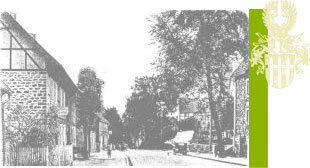 Also the son of Joist I, Johann VII remained living in Warburg, became councillor and chamberlain of the town – like his father before him – from 1586 to 1608. Johann VII died in Warburg in 1608; his descendants are not registered in Warburg any more. He is regarded as the founding father of the Thonemann branch of Scherfede. The son of Johann VII Thöne, called Thonemann, Johann Thonemann, born in the period from about 1580 to 1585, was entered as resident of Scherfede beside Cord Thonemann and his wife in 1605 according to the files of the administration of the district president in Dringenberg. He served as judge of Scherfede for many years. 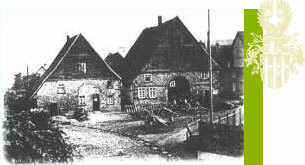 That family members of the well established Thonemann family in Warburg settled in Scherfede (see remarks on Scherfede) at all was a consequence of the loan for the monastery in Hardehausen, which then in the handing over of lands from the monastic settlement Scherfede which saw a possibility of a solution to the settlement. Johann Thöne, called Thonemann, born between about 1580 and 1585, was registered in the files of the administration of the district president in Dringenberg as resident of Scherfede in 1605, as was his brother Cord. 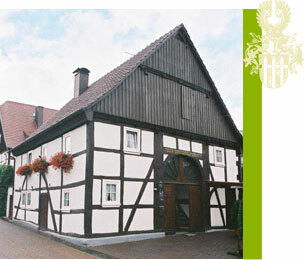 In 1620 it was reported of Johann Thonemann that he had a big property in Scherfede. He became a judge in Scherfede, the beginning and end of this high office could not be established. However he held this honorary post for a long time in very difficult war years, as it is said in an old source, "who was judge in Scherfede for a particularly long time"(see section "Scherfede in 15th and 16th centuries" for the significance of the office of judge). The name of Johann‘s first wife, they married about 1612, is not known; they had a son Johann who was born about 1620; he was mentioned in 1634 as Johann junior. This Johann junior had several small children baptised between 1649 and 1653. They all died as is seen in Scherfede papers after the Thirty Years War. At the time in Scherfede the terrible diseases small-pox and pustules were rampant which mostly had a fatal effect due to the poor nourishment of the population on account of the continuing plundering and the bad harvests in the war years. Johann (junior) probably still lived in his father‘s home. In 1643 in the devastation of Scherfede (see details in the section "Scherfede in the Thirty Years War") he also experienced the loss of the two houses of his father Johann Thonemann (judge); the loss is noted in the protocol of Scherfede (local chronicle). Johann junior was – literally – "buried on 6th January 1659". At that time he was about forty. Presumably he had no other descendants especially as his wife‘s name is unknown and whether she died in the turmoil of the war or as a result of the diseases rampant in those terrible years. Besides this a Hermann Tönemann, a farmer, is named; due to the destruction of the register of Scherfede in the last years of the war – probably also 1643 – no research is possible to ascertain whether Hermann was a son of Cord Thonemann or of Johann Thonemann. Johann Thonemann, the judge, married again after the death of his first wife; only the first name, Elisabeth, is known of this woman. The two children of this marriage are also known (because they belonged to the upper class of Scherfede). They were: Heinrich, born on 3.3.1641 and Arnold, born on 7.2.1644 in Scherfede. (What a terrible situation: the houses burnt in 1643; the residents driven out from house and farm with such small children, two and one years of age). At this second wedding of Johann between 1635 and 1640, his son Johann from the first marriage acted as witness. This is stated in the records of Scherfede. Johann (judge) died between 1655 and 1665. Heinrich Thonemann, the son of Johann (judge) from the second marriage to Elisabeth N., was born in Scherfede on 3.3.1641. It is not known whom he married, likewise in the case of his brother Arnold, born on 7.2.1644 (on account of missing documents). This uncertainty also applies for Martin born sometime between 1630 and 1640, who was mentioned along with Hermann. There are exact details available again for the next generation. Johann Heinrich Thonemann was born in 1684. Here there are exact details available again. He was the son of Heinrich Thonemann. On 23.2.1716 – another date is also given 22.11.1716 – at the time he was 32 years old – he married Gertrud Hoppen, born in 1678 – therefore six years older than he. She died in 1750; he in 1765. Heinrich and Gertrud had six children; the first child, Johann Heinrich, called after the father, was born in 1717 and died in the same year; Anna Maria, the second child, was born on 25.8.1718; the course of her further life has not been investigated. The third child, a son, again called Johann Heinrich, was born in Scherfede on 1.11.1719. He married Maria Wiemers. Bernhard Georg was born as the fourth child on 14.9.1721; this boy died in 1723 – about two years of age. The fifth child was Friedrich, born in 1722; he is regarded as the founding father of the Ossendorf Thonemann-branch. The sixth child, born on 24.12.1723, was as a Christmas present the last child from this marriage. He was called Johann Heinrich. On 16.1.1751, at the age of 27, this son married Angela Gertrud Temmen from Bonenburg (township of Warburg); she was born on 1.5.1723. Bride and groom were the same age. The couple had one son, who again like father and grandfather was called Johann Heinrich. He was born on 15.5.1758 and became a farmer in Scherfede. On 6.5. he married Eva Maria Engemann from Rimbeck. She was born on 5.1.1765 and died on 25.3.1814 in Scherfede. The couple had twelve children: 1. Johann Joseph, born on 17.3.1788; 2. Johannes Laurentius, born on 9.8.1789; 3. Johannes Andreas, born on 22.10.1791; 4. Anna Eva Margareta, born on 21.8.1793; 5. Johannes Franziskus, born on 8.10.1795, 6. Anna Maria Elisabeth, born on 30.7.1797; 7. Anna Christina Maria Elisabeth, born on 15.9.1799; 8. Anna Maria Theresia, born on 14.8.1801; 9. Anna Maria Theresia, born on 21.8.1802; 10. Augustinus, born on 14.12.1803; 11. Johann Bernhard, born on 1.8.1806; 12. Johann Anton, born on 12.9.1808. Johann Heinrich Thonemann was – as pointed out above – the third child of Johann Heinrich Thonemann and Gertrud (née Hoppen). He was born in Scherfede on 1.11.1719; died on 28.8.1762 – not yet 43 years of age. The marriage with Anna Maria Wiemers took place on 28.2.1750; three children were born during the twelve-year marriage: 1. Anna Maria Christina, born in Scherfede on 18.4.1751; 2. Johannes Heinrich, born on 8.4.1753, died in Scherfede on 25.3.1814; 3. Joes Christoph, born in Scherfede on 4.2.1756. Anna Wiemers was born in Scherfede in 1716 and died at the age of 84 on 13.1.1800. Johannes Heinrich, the second child, continued the Scherfede branch. 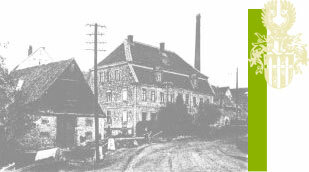 Haus Linnhoff / Hagemeyer – the brandy factory in the background, in which the Scherfede spirits "Diemel-Perle" was produced. Joes Christoph Thonemann, the third child of Johann Heinrich and Anna Maria, née Wiemers, was born in Scherfede on 4.2.1756. On 9.7.1784 at the age of 28 Christoph married Eva Maria Kohaupt – 23 years of age – born in Scherfede in 1761. It cannot be seen from the official records if Eva Maria came from Scherfede or Rimbeck. In any case between 1784 and 1790 Christoph moved to Rimbeck, as his son Johann Heinrich was born in Rimbeck 1790. Joes Christoph died at the age of 82 on 25.1.1838. His wife died after a marriage of nine years at the age of 32 on 18.3.1793. In 1793 Christoph married again. His second wife was Eva Margareta Günther, born in 1761. On 28.10.1837 she died at the age of 76. The following five children resulted from the first marriage: 1. Matthias, born on 14.8.1785; 2. Johann Heinrich, born on 7.1.1787, died 1787; 3. Johann Bernhard Heinrich, born on 9.6.1788; 4. Johann Heinrich, born on 14.2.1790; 5. Anna Maria Elisabeth, born on 17.2.1793, died in the same year. Two children resulted from the second marriage: Franziskus Antonius, born on 24.1.1794, died 1794 and Johann Franziskus Josef Antonius, born on 20.6.1801. 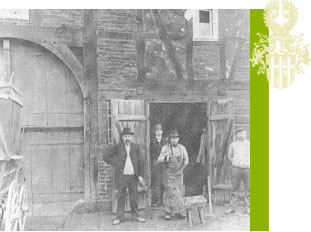 The fourth child from the first marriage is the founding father of the Thonemann family, who continued the family in Rimbeck: Johann Heinrich Thonemann, born on 14.2.1790 in Rimbeck. In Scherfede the Thonemann branch continued, but these bearers of the name had no immediate and direct connection to the Rimbeck – Dülmen branching off (direct descendants). The Scherfede and Ossendorf branches can, like the Düsseldorf branches, be traced back to Johann Thonemann 1557 to 1608 (Johann VII); he is regarded as the founding father of the Scherfeder Thonemann branch; the son Johann Thonemann was judge in Scherfede for many years. In the original land survey of 1831 covering the whole area of Warburg, according to the details of the land register there were three Thonemann properties on "Münkenhof” in Scherfede: Johann Thonemann with plots 244 and 245 (house, yardroom and garden); the house was at the entrance to "Münkenhof” on Hauptstrasse (today, 1994, Mönchshof no. 5); furthermore Josef Thonemann (probably Josef Anton), whose house was between those of Johann Schulze and Andreas Blömeken (referring to 1831) (plot 256) and Meinolph Thonemann, whose house was between those of Philipp Schäfer and Engelbert Fleischen (referring to 1831) (plots 225 and 226). 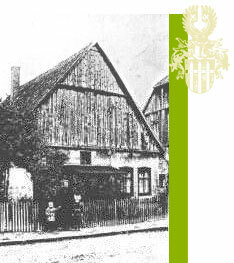 The premises of "Mönchshof” still look like then: however most of the houses and farms have been rebuilt or altered. The house is at the corner of the Federal Highways B7 and B68. The branch continued via Johannes Thonemann (born 1863); it was reported of Johannes Thonemann that he was a founding member of the Spar- und Darlehnskasse (Saving and lending bank) in Scherfede on 28.11.1891 and was elected to the supervisory board; at the forty-year general meeting on 31st May 1931 Johann Thonemann was specially honoured for his forty years on the supervisory board. Until 1940 he held this office; on 6.3.1943 he died as an 80 year-old. Johann Thonemann (born in 1899) is the next in line, then comes Johann Heinrich Thonemann, born on 31.7.1936, who today (1994) with his son Johannes Karl, born on 29.11.1965, runs his farm on Poststrasse in Scherfede. A further Scherfede line branches off from Johann Heinrich Thonemann, Scherfede, born on 1.11.1719, married to Anna Maria Wiemers. His first born son, Johannes Heinrich Thonemann, born on 8.4.1753, married Eva Margarete Engemann in Rimbeck on 6.5.1787. She was born on 9.11.1765. Four sons are known from this marriage: 1. Johann Josef, born on 17.3.1789, 2. Johann Andreas, born on 14.2.1790, 3. Johann Laurentius, born on 9.8.1792 and 4. Johann Franziscus, born on 8.10.1795. Johannes Heinrich died in Scherfede on 25.3.1814, his wife on 20.9.1848. This street was built by Napoleon’s troops. Johann Andreas Thonemann (the third son of Johannes Heinrich), born in Scherfede on 14.2.1790, married Elisabeth Blömeke in Scherfede on 19.8.1817. She was born in Rimbeck on 5.12.1796. It is reported of him that he was "Gemeindeverordneter” for some years in Scherfede. He had four sons baptised in Scherfede: Karl (Carolus) Philip(p), born on 10.12.1817, Johann Heinrich, born on 17.6.1821, Franziscus Josephus, born on 15.10.1829 and Clemens August, born on 16.5.1834. The father Johann Andreas was killed on 26th October 1845 after a drive from Obermarsberg. When backing the empty wagons at Marsberg-downtown the front wagon tipped over. Elisabeth died in Scherfede on 28.2.1868. 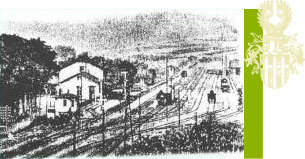 The line runs then to Karl Philipp Thonemann, born in 1817. From him it is reported that he had found his cousin Anton Thonemann early on 23 July 1854 "dead on his coal wagon, on which he had come from Dalhausen in the night”. The line goes on via Xaver Thonemann, born on 13.8.1863, who worked as a master painter in Scherfede and held the honorary community post as superintendent in Scherfede from 1912 to 1924. Xaver Thonemann’s son Rudolf Thonemann, born on 28.4.1900, was also a master painter in Scherfede, Briloner Strasse. Rudolf Thonemann’s son, Rainer Thonemann, is still alive today and is next in line. 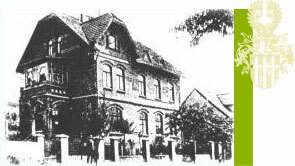 Like his father also a master painter, he took over the house on Briloner Strasse in Scherfede, however already passed the business on to his son. The son is also called Rainer, born in Scherfede on 9.2.1960. The Thonemann line in Scherfede branches off at Karl Philipp, born on 10.12.1817. On 22.11.1846 in Scherfede he married Elisabeth Hoppe, born on 18.6.1819 in Scherfede. The couple had seven children, four sons and three daughters. The sons: Johannes, born on 8.11.1850, Joseph, born on 11.11.1854, Heinrich, born on 31.1.1857 and Xaver, born on 13.8.1863; the daughters: Elisabeth, born on 1.11.1847, Maria, born on 26.4.1849 and Theresia, born on 26.1.1853. Karl Philipp was a farmer and died at the age of 81 on 2.5.1899, his wife died five years later on 7.8.1904. Now follows his eldest son Johannes, born on 8.11.1850. He was a train driver and part-time farmer in Scherfede. He married Therese Spielrump in Warburg on 12.7.1879. She had been born in Uelde on 2.5.1855. Two of their three sons, Heinrich Josef, born on 7.8.1881, and Clemens Johannes, born on 27.1.1890, were employed full-time by the Deutschen Reichsbahn (German Railways), the third son Franz Rudolf, born on 9.5.1883 died in the same year; the four daughters were Maria Clara, born 18.6.1880, died in March 1881, Maria Elisabeth, born on 13.9.1887, Theresia Catharina, born on 9.10.1892, died in April 1893 and Maria Josefa, born on 21.5.1895. Johannes, the father, died on 2.7.1920, his wife on 16.1.1918, both in Scherfede. Clemens Johannes Thonemann, born on 27.1.1890, was the next representative in the family branch. As described already, he was employed by the Deutschen Reichsbahn (German Railways) as a railway fitter. Besides this he was also a part-time farmer. On 5.10.1921 he married Juliana Blömeke, born on 30.10.1896, in Scherfede. In their 35-year marriage the couple had two sons and a daughter: 1. Anna Theresia Clara, born on 5.4.1923; 2. Heinrich Karl Johannes, born on 2.2.1926; 3. Alfred, born on 31.12.1929. Clemens Thonemann died at the age of 66 in Scherfede on 26.10.1956, his wife Juliana at the age of 83, on 16.1.1978, also in Scherfede. Clemen's son, Heinrich Karl Johannes Thonemann, born on 2.2.1926 is another representative of the Düsseldorf branch. At first he was also with the railways – after the Second World War the Deutsche Bundesbahn – then he changed to industry as a machine fitter in Düsseldorf. Here he remained employed until his retirement in 1989. He met his wife-to-be, Elisabeth Gretzke, in Düsseldorf. They got married on 30.5.1952 in Düsseldorf. The couple had two sons: Ralf Alfred Heinrich, born on 12.5.1959 and Nico Thomas, born on 12.5.1961.